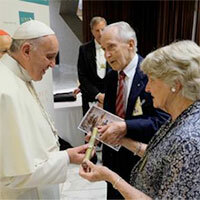 Ron and Mavis Pirola, Co-Chairs of the Australian Catholic Marriage and Family Council, presenting Pope Francis with a print from Aboriginal and religious artist, Richard Campbell while discussing the incorporation of Aboriginal culture and traditions in liturgies. Ron and Mavis Pirola, the Sydney-based Chair-couple of the Australian Catholic Marriage and Family Council (ACMFC), were one of 13 Australian couples who attended the recent III Extraordinary Assembly of the Synod of Bishops from 5 – 19 October 2014, in Rome. The theme of the Synod was ‘The Pastoral Challenges of the Family in the Context of Evangelisation’. The ACMFC is a Council of the Bishops Commission for Pastoral Life, which in turn is a Commission of the Australian Catholic Bishops Conference. Presenting at the Synod, the Pirolas commented on the “prayerful and respectful” way in which proceedings progressed and how “enormously privileged they felt in participating in such an experience of the Universal Church”. The theme of the 2015 Ordinary Synod is ‘The vocation and mission of the family in the Church and the world’. Bishops’ Conferences around the world received a preparatory document (Lineamenta) from the Vatican in mid-December 2014 for the 2015 Synod. This entry was posted in Uncategorized on December 23, 2014 by Aoife Connors.